Australia is a country which is seldom seen as a military power. It has the unique distinction of being a country and a continent, as well as an island. It greatly benefits from the lack of hostile neighbours, which allows it to build a defensive military. 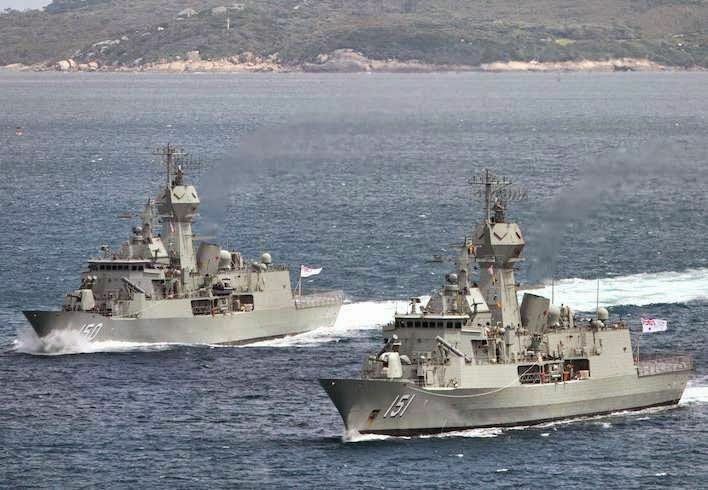 Having an extremely long coastline to protect, Australia needs to place special emphasis on its Navy and Air Force and equip them with high-tech weaponry to do the job. Sharing coastlines between the Indian and Pacific Oceans means that even though Australia doesn’t have enemies, it needs to be able to project power in the region and safeguard its territory and sea lanes in case of any unforeseen situations. Their army plays a major role in overseas UN and NATO deployments and anti-terrorism missions, which makes it necessary for them to be well equipped. The Australian Military uses a mixture of imported and locally built equipment to fulfill their duties. Here, in this article, we will learn about the 10 weapons in the Australian inventory which are very vital for their security. Side view of the Tiger. Note the nose-mounted 30 mm cannon. The Eurocopter Tiger is an advanced light attack helicopter which is designed to carry out anti-tank warfare and provide fire support for ground troops. It has a unique all-composite fuselage made out of carbon fiber, aluminium, titanium, and kevlar. The fuselage is also armoured and can withstand hits from small arms fire and cannon rounds up to 23 mm in caliber. The design is very crash-worthy and it is evident from the fact that the crew of a French Tiger survived a crash with only minor injuries. It has a self-protection suites to defend itself from IR guided missiles. 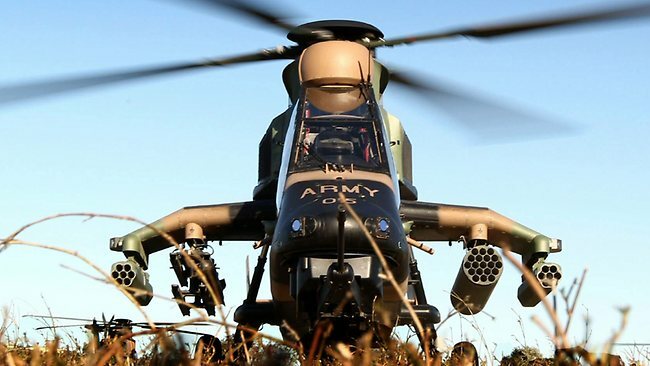 The Australian Army procured 22 of these lean and mean machines and officially designate them as Armed Reconnaissance Helicopters (ARH). Front view of the Tiger. Note the 19 cell 70 mm Hydra 70 unguided rocket pods (right inner pylon), 7 cell 70 mm rocket pods(outer pylons) and launch rails for Hellfire missiles (left inner pylon). This helicopter is armed with a nose-mounted 30 mm Nexter cannon with 450 rounds of ammunition. There are 4 under-wing hardpoints for a variety of weapons like 70 mm unguided rockets, Hellfire missiles and 12.7 mm gun pods. 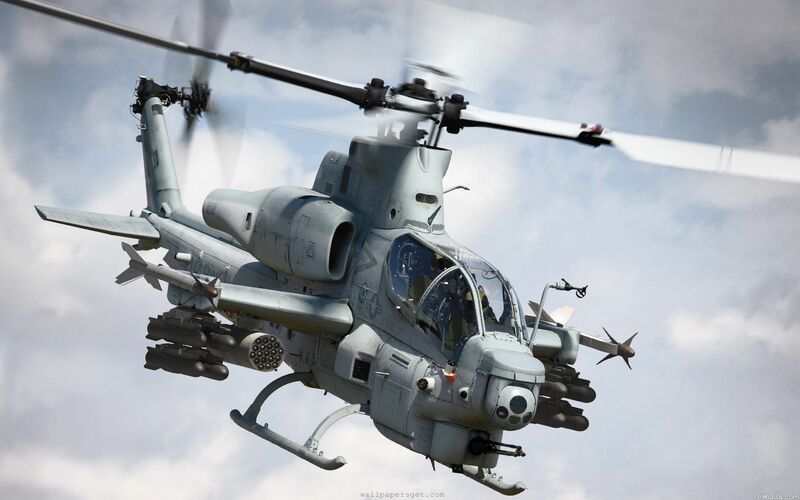 Australia recently tested the Advanced Precision Kill Weapon System laser guidance kit for use with the 70mm unguided rockets. This will further increase the effectiveness of the Tiger in a modern-day battlefield scenario as it turns a ‘dumb’ munition into a ‘smart’ weapon. The Tiger may also be operated from the Canberra class LHDs that Australia is building. 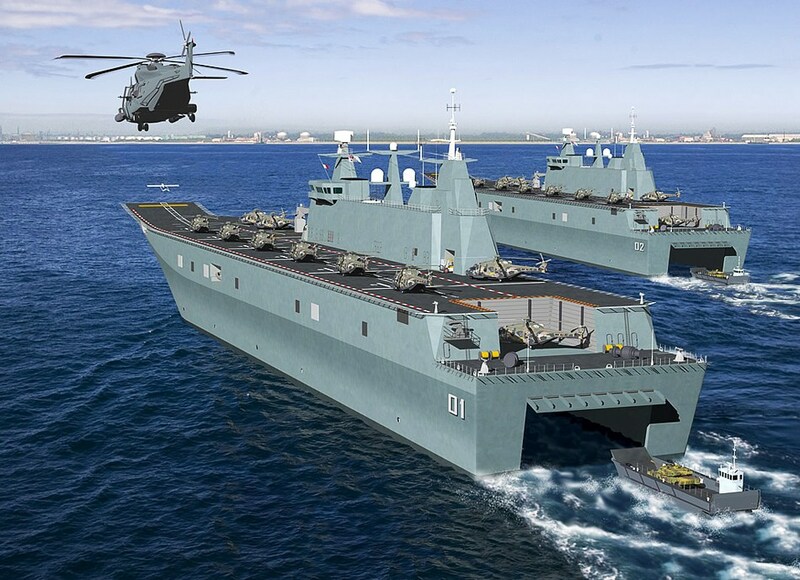 They would be effective close air support (CAS) platforms for Australian troops deployed from those ships. 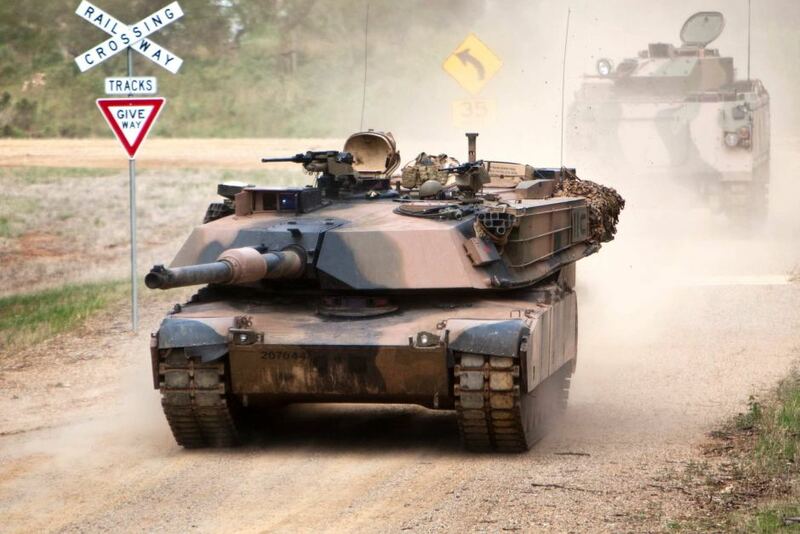 The Australian Army has purchased 59 M1A1 Abrams, which are currently in service with the 1st Armoured Regiment. Its armament consists of a 120 mm main gun with 40 rounds of ammunition, 1 × .50-caliber (12.7 mm) M2HB heavy machine gun with 900 rounds and 2 x 7.62 mm machine guns with 10,000 rounds. It has an advanced composite armour which provides protection against Armour Piercing (APFSDS) and High Explosive Anti-tank (HEAT) rounds but lacks the depleted uranium mesh-reinforced composite armour of the M1A2. The Australian M1 uses regular diesel fuel for its gas-turbine engines, instead of the kerosene-based jet fuel used by the American variants. An Australian M1 Abrams Tank during an exercise at the Edinburgh RAAF base in South Australia. An M113AS4 Armoured personnel carrier can be seen in the background. 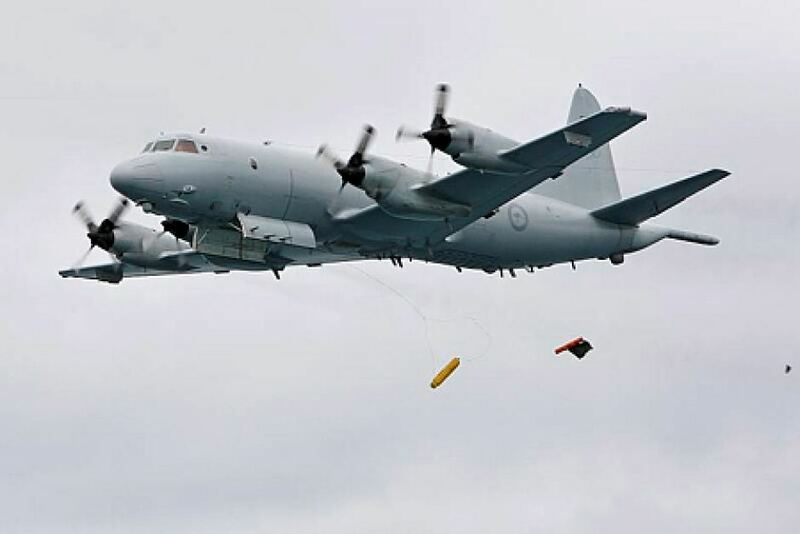 Long-range maritime patrol aircraft (MPA) are as essential as oxygen for an island nation like Australia, which has a 35,876 km mainland coastline with an additional 23,859 km of island coastline. Patrolling a total of 60,000 km of coastline is very tough, and the Australian Air Force (RAAF) has 18 advanced AP-3 Orions to do the job. The Orion has frontline duties like maritime reconnaissance, anti-submarine warfare, naval fleet support, search and survivor supply and anti-surface warfare. The AP-3 has a combat radius of 2500 km, with 3 hours on station at 500 m altitude. It can carry a variety of weapons like harpoon missiles, lightweight torpedoes, bombs, and mines internally and externally, to accomplish its missions. Sonobuoys are deployed from a launcher under the fuselage to detect and track submarines along with a Magnetic Anomaly Detector (MAD) boom at the aft. 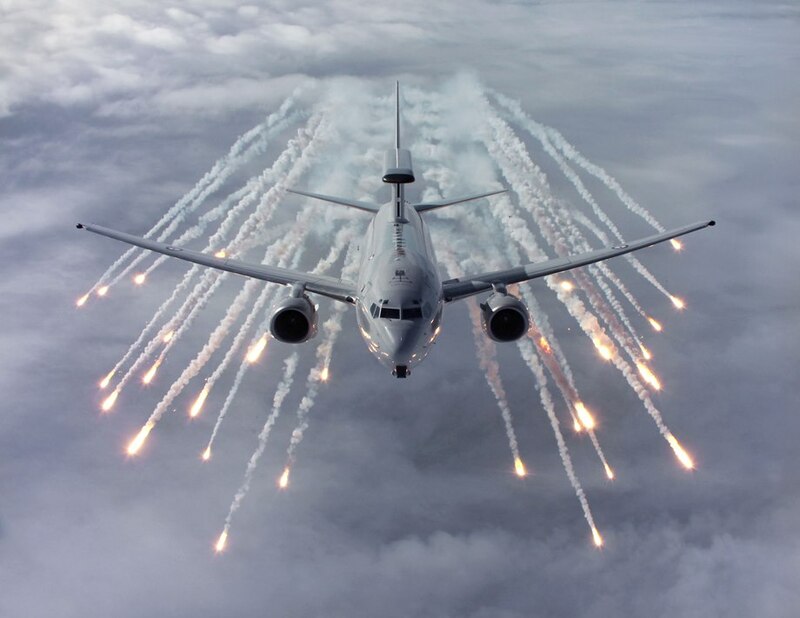 An AP-3 deploys flares. Note the MAD boom at the aft, behind the tail fin. The entire fleet received a major upgrade, which consisted of new radars, advanced acoustic, IR and optical detection systems, signals and electronic intelligence (SIGINT/ELINT) equipment and computers. It is said that the upgrades make the AP-3, one of the most advanced MPA in the world. In addition to their maritime capabilities, they can also carry out surveillance and search missions over land and have been deployed frequently to monitor Australian bush-fires and search for survivors using their high-resolution cameras. Australia’s AP-3 fleet will be replaced by the new P-8 which can do the job better and the MQ-4 Triton drone which can patrol for thrice as long as an AP-3. This mixture of high-tech manned and unmanned aircraft will allow the RAAF to safeguard their coast more effectively. An AP-3 deploys sonobuoys and torpedoes. 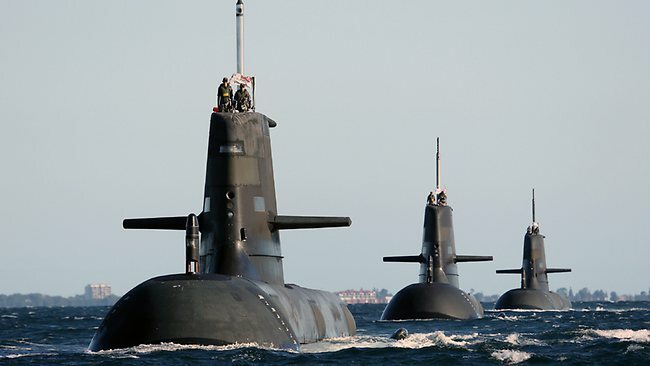 Conceived as a replacement for the aging Oberon class, 6 Collins class submarines were built in Australia between 1990-2003 by the Australian Submarine Corporation (ASC). These 3100-ton submarines are based on a modified Swedish Västergötland class. During its construction and initial service period, the Collins class faced severe technical problems and multiple defects were found in construction, hull design, propulsion system, periscope and the combat system. This led to a large number of negative press reports which tainted the image of these submarines. These problems have been rectified and the Collins are among the most advanced diesel-electric submarines in the world. However, the biggest problem faced by this class is the severe shortage of trained submariners and the RAN can afford to crew only 3 submarines at present. Each submarine has 6 × 530 mm bow torpedo tubes for a mix of 22 Mark 48 torpedoes and UGM-84C Sub-Harpoon anti-ship missiles. The maximum diving depth is over 200 m and its has an endurance of 70 days. The Collins have participated in various operations ad exercises and have performed exceedingly well. During RIMPAC, a Collins class sub managed to ‘sink’ a US Navy carrier, performed on par with US Navy nuclear submarines and was noted for its quietness. These submarines are expected to be replaced around 2025 by a next-generation fleet and the present choice is the Japanese Soryu class. The Super Hornet was never in the Royal Australian Air force’s (RAAF’s) cross-hairs. But large delays in the delivery of the F-35, the retirement of the F-111 and the impending retirement of the F/A-18 Hornet fleet, necessitated the purchase of 24 Super Hornets from the US as a stop-gap measure. This proved to be a good decision as the Super Hornet brought the familiarity of the Hornet along with advanced features like the AN/APG-79 AESA radar. It also had the ability to launch weapons like the AGM-84K anti-ship and land attack missile, AGM-88E anti-radiation missile, AGM-154C Joint Standoff Weapon etc. The F/A-18F is a twin-seater and the rear cockpit will have an advanced attack-station for an enhanced strike capability. The Super Hornets will serve alongside the F-35A in the RAAF after the Hornets are retired by 2021. 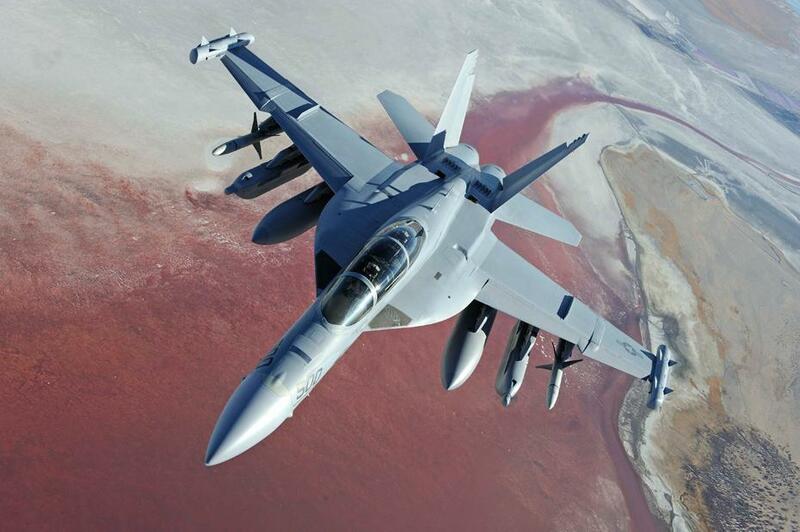 The RAAF will be the only foreign operator of the E/A-18G Growler, which is an electronic warfare variant of the F/A-18F. The Growler has no equivalent and can easily jam most existing air defense systems, thus playing a decisive role in modern warfare. It offers the RAAF, capabilities that most Air Forces can only dream of. It comes with an advanced electronic warfare suite comprising of internal and external jammers, AESA radar and advanced anti-radar missiles. The details are shown in the graphic below. It is interesting to note that the Growlers will be an additional purchase and 12 of the existing Super Hornets will not be converted into the Growler as earlier thought. This will result in a fleet of 24 Super Hornets and 12 Growlers, which is a very formidable attack combination, especially when used along with the new F-35A’s. The Anzac class frigates were built as long range frigates with limited multi-role capability. But they underwent a major upgrade which added cutting edge sensors and weapons, transforming them into one of the most advanced frigates in the world. Currently, 6 ships have been upgraded to this standard and the remaining 2 will follow suit. The upgraded Anzac has an integrated mast for radars which only a handful of ships in the world possess. 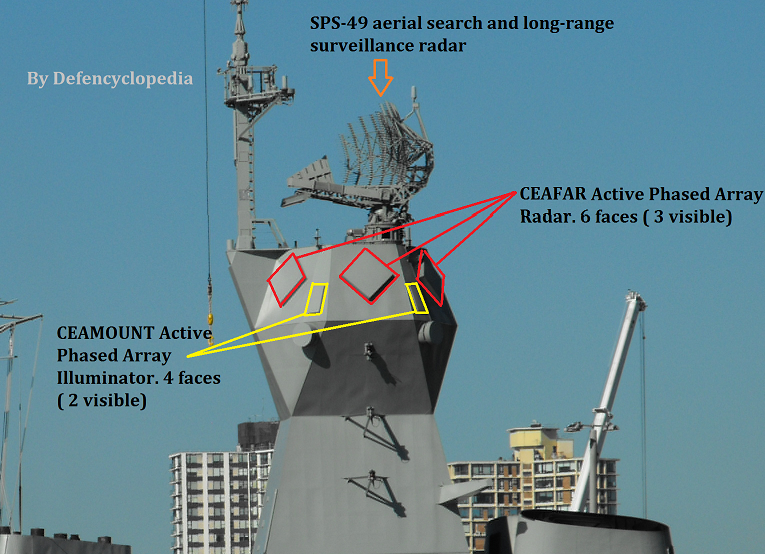 The mast now contains 3 different types of radars as shown in the infographic below. 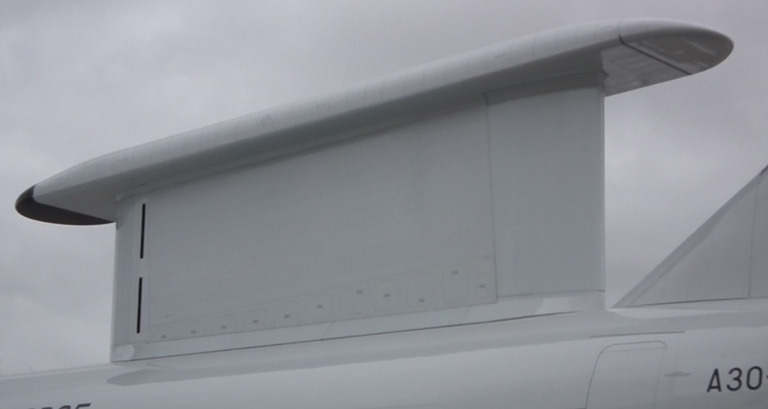 The CEAFAR radars are mounted as a set of 6 panels, each scanning 60° in azimuth for surface and aerial threats for a total of 360° continuous coverage. The CEAMOUNT illuminators provide fire control data to the 32 RIM-162 Evolved Sea Sparrow Missiles and the SPS-49 provides long-range air search. Its weapons layout consists of 32 ESSM is place of 8 Sea Sparrows, addition of 8 Harpoon Block II anti-ship missiles and replacement of the American Mk 46 torpedoes with the European MU-90 ones. The new sensors installed after the upgrade to form the integrated sensors mast. Note the exhaust funnel just behind the mast. Airborne Warning and Control Systems (AWACS) are very effective force multipliers and play a vital role in combat. 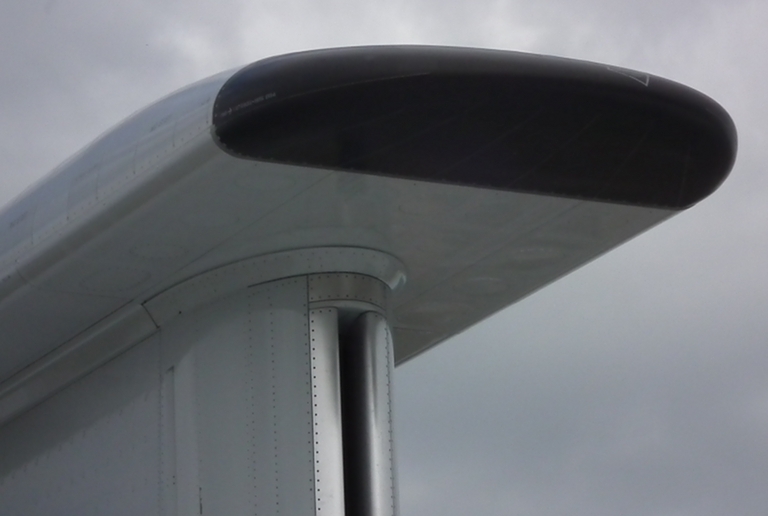 Every credible Air Force needs to have a fleet of AWACS for surveillance of airspace, providing early warning against hostile aircraft and controlling friendly aircraft over the battlefield. Australia uses the E-7A Wedgetail AWACS which has an advanced Multi-Role Electronically Scanned Array (MESA) radar for providing 360° coverage. You must have noticed that the radar is uniquely shaped and doesn’t have the traditional rotodome . It instead uses fixed radar arrays with electronic beam steering for providing all-round coverage. The L-band MESA has a range of 600+ km against fighter sized targets and 240+ km against frigate sized targets. The radar is capable of tracking 180 targets at once and can conduct 24 target intercepts simultaneously. The components of the radar system which enable 360° scanning without any moving antennae is explained below in the pictures. The front and rear lobes provide 60-degree coverage each. These assets are important for the Army and Navy as well as they can share information with land vehicles and warships to provide a tactical information and a better picture of the battlespace. The E-7A has a mission endurance of 10 hours and can monitor an airspace of 4 million sq km in that time. It has been deployed in Iraq, where it routinely performs long-endurance missions which can last up to 16 hours. Since it is based on a Boeing 737-700 commercial airliner airframe, it makes pilot training and maintenance easier and cheaper. Currently, Australia operates 6 E-7A’s which are operated by the No.2 Squadron based at RAAF Williamtown. Since the retirement of HMAS Melbourne, Australia’s sole aircraft carrier in 1982 , the RAN has lacked a large and capable flattop to carry helicopters and aircraft. It’s retirement also degraded their military sealift and disaster response capability. HMAS Tobruk and Kanimbla class Landing Ship Docks have served since then and fulfilled those roles to a limited extent. But the RAN needed a capable ship which could meet its 21st century requirements for overseas deployments. The Canberra class landing Helicopter Dock, a derivative of the Spanish Juan Carlos LHD was chosen to serve the role of an aircraft carrier and strategic sealift vessel. These massive ships are immensely capable and give the RAN unmatched amphibious capabilities in the region. CGI of the 2 Canberra Class LHDs operating together. 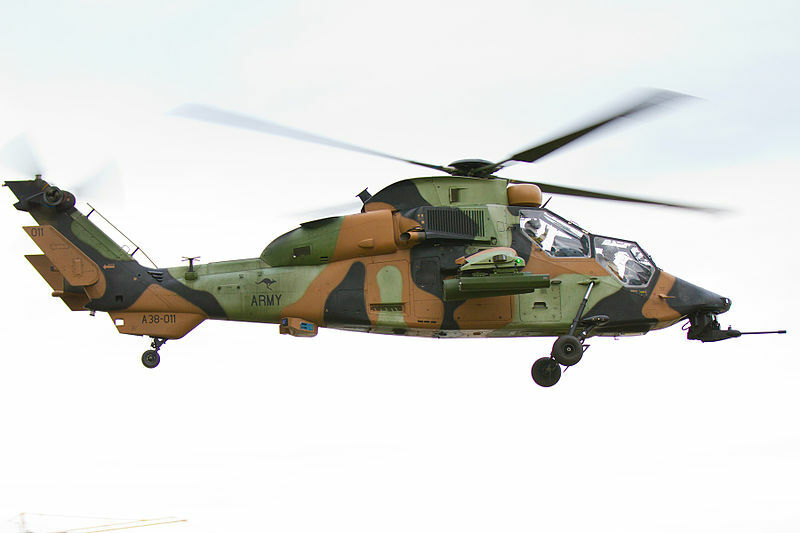 Note the RAAF NH-90s operating off the deck. Also note the UAV taking off from the ski-jump of 01. The Canberra class LHD is 230 m long, 32 m wide and displaces 28,000 tons when fully loaded. It can accommodate up to 110 vehicles in the vehicle deck, 18 helicopters in the hangar and 10 more helicopters on the flight deck. 1000 troops can be carried in standard configuration for long deployments and an overload of 1600 troops can be carried for short duration in an emergency. The ski-jump was meant to be removed from the final design, but was retained after it was found that the redesign without the ski-jump would be a very expensive modification. This actually adds a relatively unknown benefit of giving these ships the ability to launch medium UAVs using the ski-jump as shown in the above photo. There is also a possibility that the RAN may procure F-35Bs to operate off these ships, although the option has been ruled out for now. The Canberra class will be the spearhead of the RANs power projection and humanitarian missions for decades to come. The RAAF will get a major boost with the induction of the stealthy 5th gen F-35A fighter, which will replace its existing F/A-18 Hornet fleet. The 12 billion $ acquisition program covers the cost of 72 fighters and their associated training and equipment. 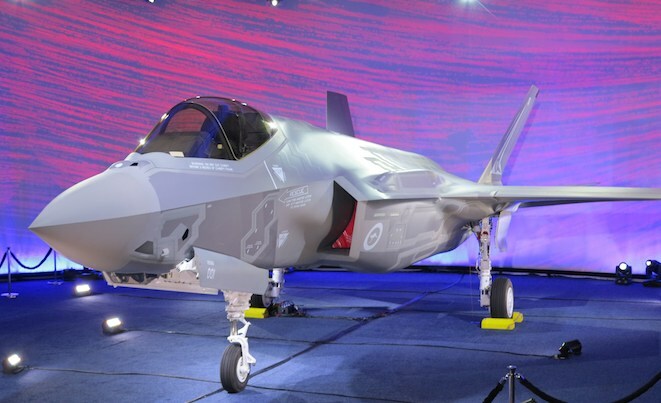 These F-35s will also feature a large number of Australia-built components. It’s advanced AESA radar, internal weapons carriage, sensor fusion and advanced networking ability will make the RAAF, the most advanced air force in the southern hemisphere. Operating along with the E-7A AWACS and E/A-18 Growlers, the RAAF will be able to dominate in any future conflict in the region. The 3 F-35A squadrons may be augmented by a 4th to eventually bring the total number to 100 aircraft. The first batch of F-35s are expected to be fully operational by 2018 and all 72 aircraft will probably be delivered by 2023 to coincide with the retirement of the Hornets. AU-1, the first of a planned 72 F-35s for the RAAF. The Hobart class Air Warfare Destroyer was conceived as a replacement for the Perth class destroyers which served in the RAN till 2001. The primary role of the Hobart class is to provide air defense for the RAN fleet and mainland from hostile aircraft and missiles. It is essentially a mini-Arleigh Burke in functionality and the design is based on the Spanish Álvaro de Bazán class. Its main anti-air armament consists of 48 Mk 41 VLS cells to carry a mixture of SM-2, SM-6 and ESSM Surface to Air missiles. The usual balanced configuration would be 32 SM-2, 8 SM-6 and 32 ESSM ( 4 missiles per cell). This will offer the Hobarts a layered air defense system with a large number of missiles and the ability to strike aerial targets at a distance of 350+ km and as close as 1 km. 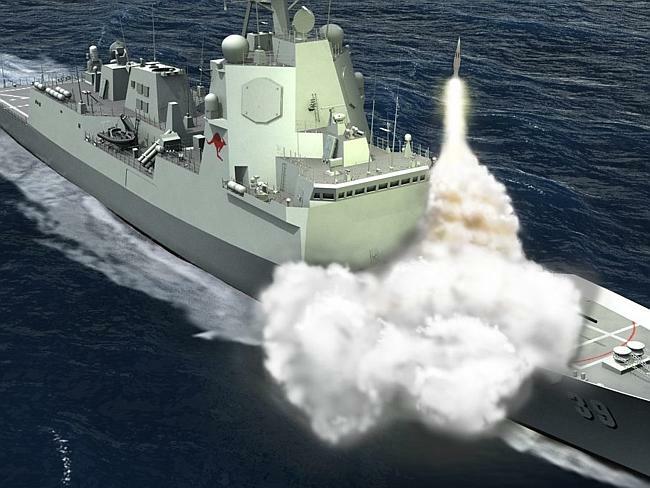 The ultra-long range SM-6 will be a game changer as its range will allow the 3 ships to protect the entire North Australian coastline in a networked air defense mode. One Phalanx CIWS is provided for last ditch defense against cruise missiles. These ships are assigned with secondary anti-submarine and anti-surface roles and carry a decent weapon load to do their job efficiently. 8 Harpoon anti-ship missiles are carried for surface warfare and 2 twin light-weight torpedo tubes are fitted for the MU-90 torpedo. 2 x 25mm M242 Bushmaster cannons are fitted in Typhoon mounts for engaging close surface threats like hostile small craft. 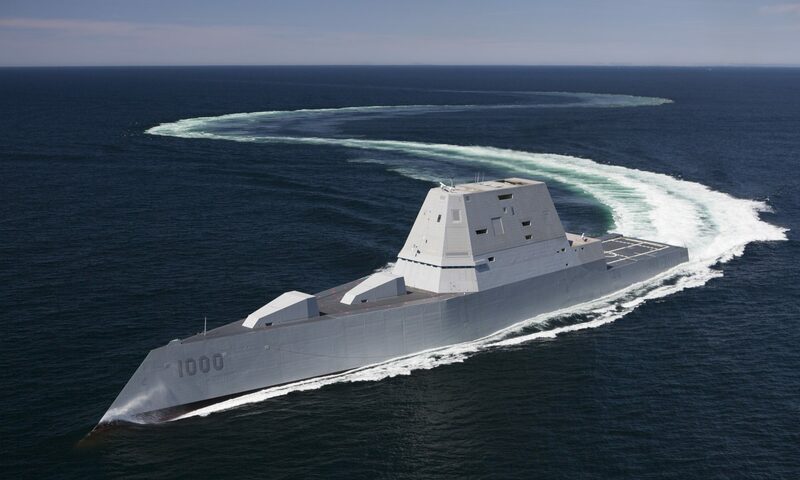 Just like the Arleigh Burkes, it has the Aegis combat system with the SPY-1D S-band radar which can search and track air and surface targets at over 300 km. The SPQ-9B X-band horizon search radar is a unique addition which will help in the early detection of sea-skimming missiles. It has a single hangar for 1 S-70B Seahawk which will be used for utility and ASW roles. At around 3 billion $ apiece, these are the most expensive ships of their kind. These 3 ships will play a major role for the next 30 years and have no equivalents in the region. This article has covered the most important and powerful weapons of the Australian military which will play a big role in the future. Newer acquisitions in the future will add to their existing capabilities and the list will be updated when that happens. If you enjoyed reading this article, do rate it below. Thank you 🙂 I am working on more such articles . The P3 Orions are air force not navy. When you say the Hobart class destroyer radar has a range of 300 km, is that radius? So extreme from one side of the radar “circle “.is 600 km? Can’t help but feel that the SH60R should be on the list ahead of the Tiger. The Tiger has actually proved to be a bit of a dog. This is an excellent article, and excellent work was done . 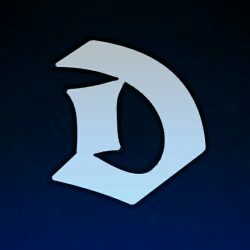 But it’s nearly 2019 and it’d be great if some updates were made to this, and other articles. For example, the RAN can now crew 4.5 subs and they have P-8’s now.